Thanks to the input of a reader I updated the East German CPU page to be much more accurate as to the various institutions that existed, and their respective logos. There were institutions in three different cities (Erfurt, Frankfurt, and Dresden), and they had amongst them 7 different names and a variety of logos. 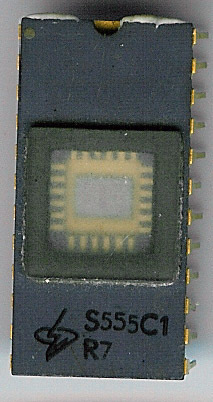 It helps to remember that IC’s were made different in East Germany. There was not so much corporations as we think of them in the West such as Intel or AMD that made this or that. In East Germany (and the USSR) IC’s (and most everything else) were made by institutions, that were typically a government organization, or sanctioned by the government to do/make certain things. These could be changed, consolidated, opened/closed at the whim of the government resulting in a lot of confusion in identity. Add to that the changes brought with the fall of communism, and these institutions transition to modern corporation and you get some very interesting collecting opportunities. The updated page should help ID’ing them a bit easier. 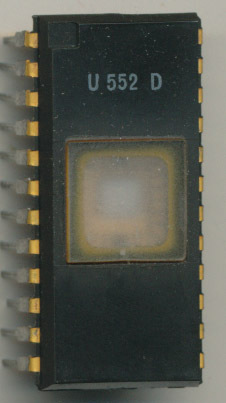 Today’s EPROM is a very rare early prototype from MME (VEB MikroElektronik “Karl Marx” Erfurt ). Part of the East German state-owned electronics business. MME (and their predecessor FWE) made clones of Intel 1702, 2708-2764 EPROMs as well as many processors. These were all unlicensed, reverse engineered, or copied via industrial espionage since this was all before the end of the USSR, and the technology blockade put in place to ‘prevent’ Eastern Europe from using Western technologies. This particular U552D is a clone of an Intel 1702A, however, it is made in a plastic package (with what appears to be a actual quartz window). A very unusual package that was used in Soviet devices mainly and very rarely in the west. 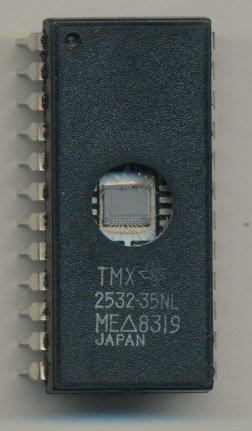 The only western EPROM I have found in plastic is a prototype TMX2532-35NL from Texas Instruments (thus the TMX prefix). However, the MME U552D actually has the window glued to the top of the plastic package, rather then integrated into it like the TI, and the Soviet designs.